Scitable by Nature ... NEW ! Discussion Forums ... Updated ! PCR related hard cover Books ... Updated ! 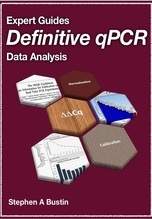 An exhaustive guide to assay design for quantitative real-time PCR. The book describes the basic concepts important for amplicon selection and primer and probe design. There are step-by-step examples for designing probe-based and SYBR Green assays targeting mRNA and fungal pathogens using several popular design programs. These are then exposed to extensive in silico analysis to identify the optimum amplicon/primer/probe combination. There is a detailed trouble shooting guide, a listing of instruments, reagents and additional information available on the internet, all with hyperlinks. In addition, there are three Keynote presentations summarising the main concepts of standard assay design, multiplex assay design and explaining the rationale behind MIQE, the guidelines for qPCR publication transparency. => Biocompare Product List - PCR NEW ! => Biocompare Product List - real-time PCR NEW ! Biocompare Article List - real-time PCR NEW ! If you have an interest in science, or specifically in genetics, you can always turn to scientific journals and publications for information. But if you're looking for reference material or an opportunity to connect with researchers and scientists in the field, Scitable can help. Scitable is billed as a learning and research tool for people interested in genetics, but under the hood it's much more than just a reference utility. The service offers you the ability to connect with researchers and scientists around the globe and influence the scientific discussion around genetics while also giving you a way to learn more about it. The first thing you'll want to do at Scitable is sign up for an account. They're free, and give you access to all of the site's features, including the ability to create a profile for yourself, contribute articles and multimedia to the community, and access to the site's over 150 free articles and peer-reviewed papers on topics from genetic engineering to evolutionary biology. The service is aimed primarily at teachers, professors, and their students, but if you have an interest in science, biology, or genetics, don't hesitate to sign up. What's new at GoPubMed ... ? The first major change is that MeSHPubmed is now included in GoPubMed. Gene Ontology (GO) and Medical Subject Headings (MeSH) are now integrated into one application. This change was requested by many users and enables the joint search in molecular biology and medicine! Novel award winning text mining method for automated recognition of protein names. Proteins are linked to the UniProt database. Using the clipboard functionality the user can collect selected articles from one or more searches and export them to Endnote, BibTeX, Plain text, or XML formats. New export functionalities for each citation or the first 100 search results. Toggle between abstract and snippet view. HotTopics, an alternative way to get an overview on biomedical literature over the last years, is automatically linked to your query. A complete new interface. Like it? Drop us a comment: help@transinsight.com ... we appreciate! allows you to browse the ontologies and display only papers containing specific GO and MeSH terms. After performing a search, the resulting abstracts are annotated with your query keywords and GO and MeSH terms. The abstracts are grouped using the GO and MeSH terms, which appear in the text. Now the GO and MeSH hierarchies can be used to systematically explore the search results. Note that only a subset of all GO and MeSH terms may be relevant to your query. This subset – more frequent terms - is presented on the left hand side. Sorting documents to a highly organised network facilitates the finding of relevant documents significantly. The hierarchy of content shows the whole GO and MeSH ontologies. GO and MeSH serve as table of contents in order to structure the over 16 million articles of the MEDLINE data base. New search functions on Google Scholar ! Google Scholar enables you to search specifically for scholarly literature, including peer-reviewed papers, theses, books, pre-prints, abstracts and technical reports from all broad areas of research. Use Google Scholar to find articles from a wide variety of academic publishers, professional societies, preprint repositories and universities, as well as scholarly articles available across the web. Google Scholar (http://scholar.google.com) provides a new method of locating potentially relevant articles on a given subject by identifying subsequent articles that cite a previously published article. An important feature of Google Scholar is that researchers can use it to trace interconnections among authors citing articles on the same topic and to determine the frequency with which others cite a specific article, as it has a "cited by" feature. This study begins with an overview of how to use Google Scholar for citation analysis and identifies advanced search techniques not well documented by Google Scholar. This study also compares the citation counts provided by Web of Science and Google Scholar for articles in the field of "Webometrics." It makes several suggestions for improving Google Scholar. Finally, it concludes that Google Scholar provides a free alternative or complement to other citation indexes. Can't find the right info or publication on my sites ? Try a PubMed search ! DiscoveR8.com provides the scientific community with a place to share and promote your discoveries. Our users can both rate the general quality and overall relevance of each posted article. By recommending your own or others' papers on DiscoveR8, you not only grant them wider exposure to the internet community at large but also potentially increase its professional impact. DiscvoeR8.com has just entered its beta test cycle. We would like to invite you to the beta test. By participating in the beta test period of a site like DiscoveR8, you would set precedents for the tone, decorum, range of topics and level of intellectual depth of the discussion. We welcome any contribution that you might see fit to make. All news related to enzymatic DNA replication. What's new in transcriptional and post-transcriptional regulation. The latest from the field of computational biology. Editor Ilona Miko - Cell biology is the study of cell structure and function, and it revolves around the concept that the cell is the fundamental unit of life. Focusing on the cell permits a detailed understanding of the tissues and organisms that cells compose. Some organisms have only one cell, while others are organized into cooperative groups with huge numbers of cells. On the whole, cell biology focuses on the structure and function of a cell, from the most general properties shared by all cells, to the unique, highly intricate functions particular to specialized cells. BioTech Science Dictionary (University of Indiana) provides an illustrated glossary containing terms associated with genetics and biochemistry; the dictionary also includes some terms associated with biology, chemistry, pharmacology, toxicology & medicine. BioABACUS a searchable database of abbreviations and acronyms in Biotechnology that contains terms in such categories as: Biochemistry, Cell Biology u.a. A Web of On-line Dictionaries (Bucknell University) is linked to over 600 dictionaries in 150 languages; the site also has a convenient Quick Look-Up function. WWWebster Dictionary provides easy access to the Merriam Webster dictionary and thesaurus. Nature Protocols is an online resource for protocols, including authoritative, peer-reviewed 'Nature Protocols' and an interactive 'Protocols Network'. The two create a dynamic forum for scientists to upload and comment on protocols. BioTechniques' Protocol Guide Offers Solutions for Science. BioTechniques®' Protocol Guide is a collection of detailed, optimized procedures/protocols for use in the lab. Organized by category, BioTechniques' Protocol Guide contains specific applications of commercial products in a wide range of areas. Even better, protocols are updated quarterly to provide you with the very latest product information. With BioTechniques®' Protocol Guide, you have access to detailed product information in a downloadable PDF format-which can be easily added to a notebook for ready access. Each protocol is accompanied by a link to the company web site and an e-mail link to contact the company directly. Each of the collections on this page is a category-specific archive of Methods published in NAR from 1999 to the present. The numbers in parentheses show the number of articles currently in each collection.